Russian President Vladimir Putin: Russia is not trying to claim the role of a superpower. Russian President Vladimir Putin has disagreed with U.S. President Barack Obama who said that Russia is a regional power and sees the Americans as an exceptional nation. "Every individual, all the more so the President of the United States, is entitled to his or her own opinion on anything, on partners and on other countries. That is his own opinion, as I also know his opinion that the American nation, the United States is unique. 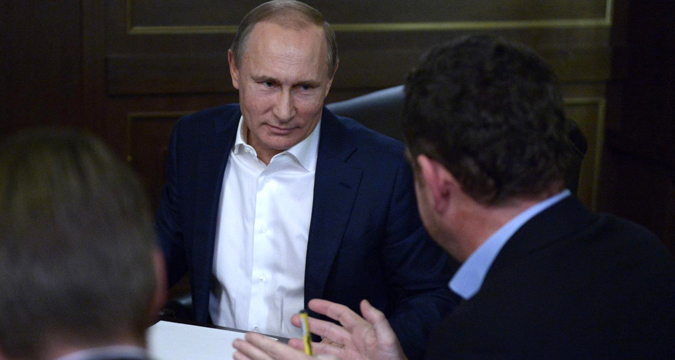 I cannot agree with either of those opinions," Putin said in an interview with the German Bild newspaper. Russia is not trying to "claim the role of a superpower," the President said. "This role is very costly and it is meaningless. Our economy is fifth or sixth in the world in terms of volume. It may have moved down to a lower place at present taking into account the economic difficulties I have mentioned but we are confident that we have very good development prospects and potential. We occupy, roughly, the sixth place in the world in terms of purchasing power parity," Putin said. If someone speaks of Russia as a regional power, they should clarify what region they refer to, he said. "Look at the map and ask: "What is it, is it part of Europe? Or is it part of the eastern region, bordering on Japan and the United States, if we mean Alaska and China? Or is it part of Asia? Or perhaps the southern region?" Or look at the north. Essentially, in the north we border on Canada across the Arctic Ocean. Or in the south? Where is it? What region are we speaking about?" Putin said. He added: "I think that speculations about other countries, an attempt to speak disrespectfully about other countries is an attempt to prove one's exceptionalism by contrast. In my view, that is a misguided position."